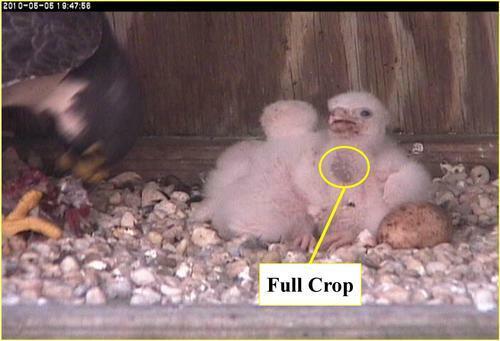 The Richmond falcon chicks are doing well. All three are active and taking part in the frequent feedings by the adults. In this photo you can see the full crop on this young bird. The crop is an expandable, muscular extension of the esophagus that allows the birds to rapidly consume large meals. The food is later released into the stomach to be digested at the bird’s leisure in a safe and secure environment. The adults continue to be somewhat attentive to the remaining egg, tucking it under their breast when they brood the chicks and we’ve seen no pip or any other sign of hatching.